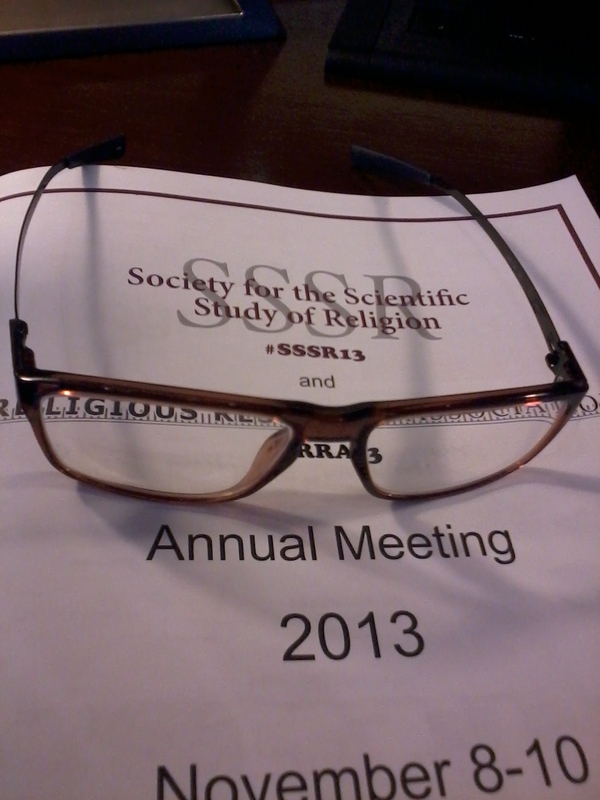 As the picture suggests, I’m at the meeting of the Society for the Scientific Study of Religion happening this weekend in Boston. As I’ve listened to the first half-day of papers, I’m reminded of the strange but helpful role that sociologists play in understanding the dynamics of religious life. When I first started teaching, I ran across a book in the college library about how one couldn’t be a Christian and a sociologist at the same time. It would, the author suggested, inevitably lead to a compartmentalization of faith. It bothered me so much that I developed a special rebuttal for the opening of my sociology of religion course. It’s helpful, I said, to see the church as a sociological entity because we can isolate the dynamics it shares with other institutional forms. While those observations can prove difficult, they are helpful in the long run. The rebuttal ended with a celebration of God’s Invisible Church, the Body of Christ, because there is no good sociological reason that the church has survived two millennia of occasional stupid and wrongheaded actions. In short, the religious forms we see are only the institutionalized representations of this deeper theological idea. None of my students applaud at the end of that speech, but I felt better. Maintaining such a distinction requires being able to see both the church as sociological structure and the Church as theological reality simultaneously. In other words, we need bifocal lenses. We need to be able to see close-up and far away. To be more accurate, my glasses in the picture are technically “progressive” lenses. That means that there is no sharp distinction between the immediate and the far-off. I see things as a smooth transition from one to the other. So it is with sociology and faith. The distinction is not quite as sharp as we might think. One of the papers I liked this morning was by Jay Demerath, a significant figure in sociology of religion circles. I loved that he ended his paper with a poem in Dr. Suess fashion that combined sociology, Durkheim, and St. Peter. But more importantly, he suggested that Durkheim’s distinction between Sacred and Profane maybe needed another factor. He said we should be thinking about the Secular, the Ordinary, and the Profane. (Durkheim’s use of profane was the opposite of Sacred and not in reference to Miley Cyrus videos!) Jay was speaking to what I mean in seeing things with progressive lenses (not politically progressive but seeing smooth movement from one to stage to another). Here’s another fact about my glasses (actually my eyes). I was born with wandering eye, so sometimes my eyes would cross. Basically, my right eye just did whatever it wanted. So when I was three, we went to the hospital and the doctors cut a muscle in my right eye. There are some lingering effects, but the key one is that I don’t see stereoscopically. In other words, Magic Eye puzzles and 3-D movies are wasted on me. My eyes don’t work together. While my left eye is dominant (and I’m aware I’m using it), I can easily switch to my right. If you’re following my analogy, it means that I can see the purely sociological AND the deeply spiritual depending on how i decide to look. I’ve been blessed and cursed with being aware of both simultaneously. I went to the Durkheim session today because he’s been on my mind lately. I’m not really a Durkheimian but I find his thought helpful, especially when ferreting out some complex phenomenon. In Division of Labor in Society, he distinguished between structures based on Mechanical Solidarity and those based on Organic Solidarity. In the former, the primary dynamic is sameness. Everyone shares values and norms. Violation of those norms results in serious sanctions, including expulsion or death, because to tolerate a breach in the barriers that separate those “in here” from those “out there” is deeply threatening to the entire social group. Group members believe in the validity of their positions by internalizing what he called “collective conscience”. While this is an oversimplification, the primary dynamic of a group based on mechanical solidarity is maintaining the cognitive, symbolic, and behavioral boundaries that give the group identity. Organic solidarity, on the other hand, is based on interdependence. In a diverse society, characterized by lots of different perspectives and values, what binds a group together is their division of labor. It is because they need each other to flourish that they must overcome the differences. Perceived violation of norms results in actions taken to restore relationship. You can’t send people out of the group because you need them. As I wrote last week, I’ve been thinking about the dynamics of evangelicalism in a pluralistic world. We have to find ways of maintaining a faithful witness even if the world around us is increasingly diverse. But we cannot do so by trying to manage the boundaries between in-groups and out-groups. Instead we must see other groups as connected to us, even if we don’t fully understand. That’s part of the ongoing millennial response against rigidity in the church (see this piece that Addie Zierman had today in The Washington Post as an example). They just want to figure out how to be faithful Christians without separating from their social circles. Religion was the topic for ethnic relations Tuesday night. I did a quick overview of Durkheim on religion and then showed two news reports on relationships between Christian Churches and Islamic Centers (I was setting up next week’s look at Muslim Americans). One report was from Murfreesboro, TN. The other was from Cordova, TN. I’m suggesting that the Murfreesboro folks were responding in a way consistent with mechanical solidarity while the Cordova church was based on organic solidarity (there’s even the added piece of interconnection between the pastor and the cardiologist). I told my class that whenever the church is focused on boundary maintenance instead of faithful witness, we’re getting it wrong. They didn’t applaud, but they made me repeat and unpack what I’d said. They didn’t get the whole mechanical/organic lecture but what I was saying did seem to speak deeply to my class of millennial evangelicals. Another helpful paper today was by Purdue sociologist of religion Fengang Yang. He spoke on the relationship between Religious Pluralism and Religious Freedom. He had a helpful contrast between pluralism at an individual level and pluralism at a social level. This distinction allowed him to argue that even if individuals believe that their approach to religion is right and true as opposed to others, they still have an interest in protecting the role of the others because that’s necessary to sustain the individual’s own religious freedom. The structural religious freedom allows for the conversation about the individual differences. Fengang didn’t talk about Durkheim at all in his talk, but I saw his analysis as a wonderful illustration of organic solidarity. I’m certainly not trying to use my glasses to disrupt the faith. The sociology is only one of the lenses. The other lens, the Christian lens, still sees God operating to build his Kingdom through His church. Seeing clearly depends on keeping both in balance (which those of you who like 3-D movies can do far better than I). I’m not abandoning commitments to right and wrong. I’m saying that using bifocal lenses lets us see how others see us and the complexities of culture. It’s important that we begin with the recognition that we’re all in this together and then begin the hard work of figuring out what that means. Doing so will require clear vision from all of us. « Why Does Postmodern Society Need Christian Universities?